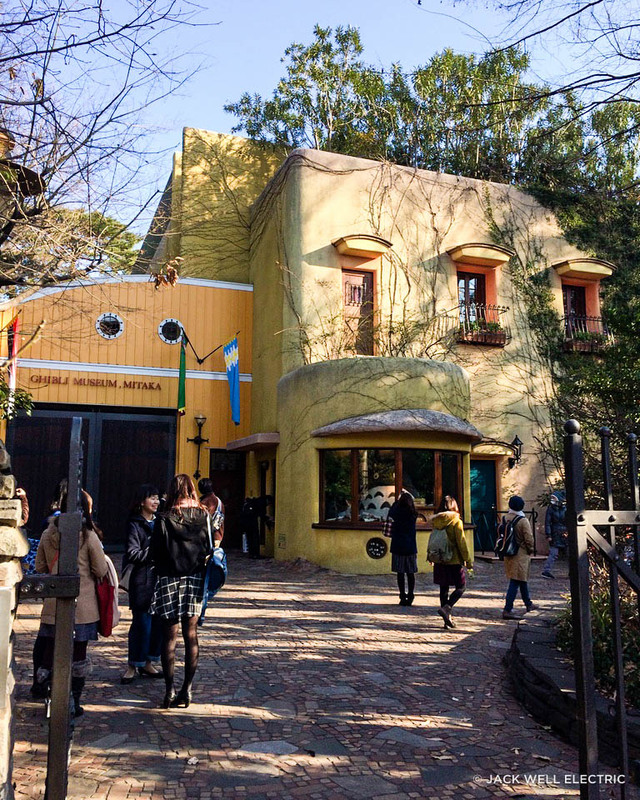 Being a huge Studio Ghibli fan, I of course wanted to visit the wonderful and secretive Ghibli Museum. I say secretive because photos aren’t allowed inside the museum, so I had no idea what to expect… Except that it’d probably be awesome. 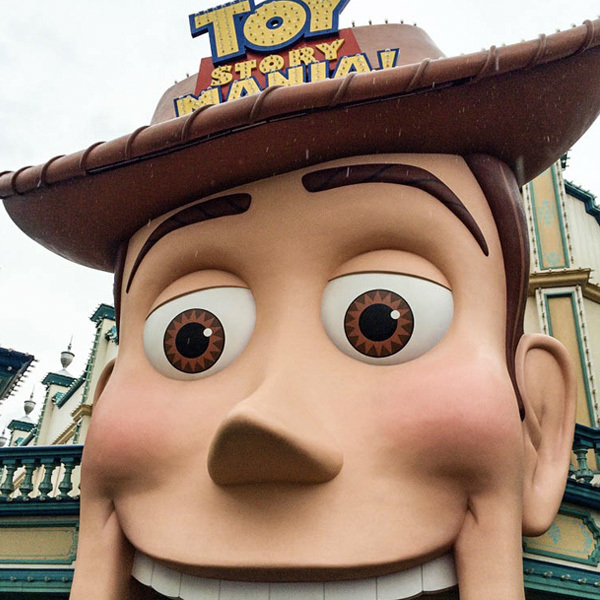 It didn’t disappoint. 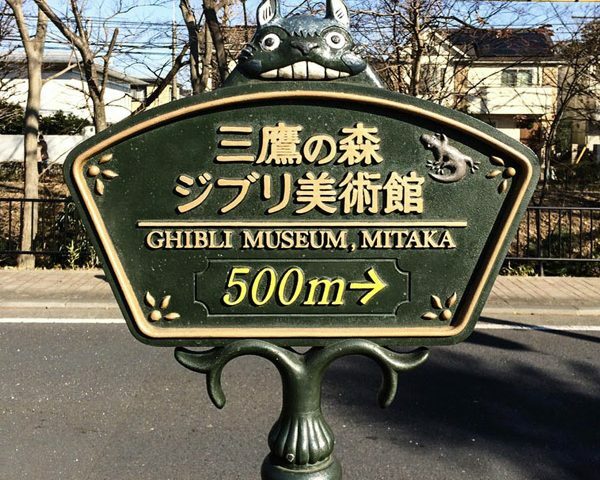 When we arrived at JR Mitaka station we decided to walk to the museum instead of taking the bus and it was definitely the right decision! The walk was easy, short and wonder-filled! 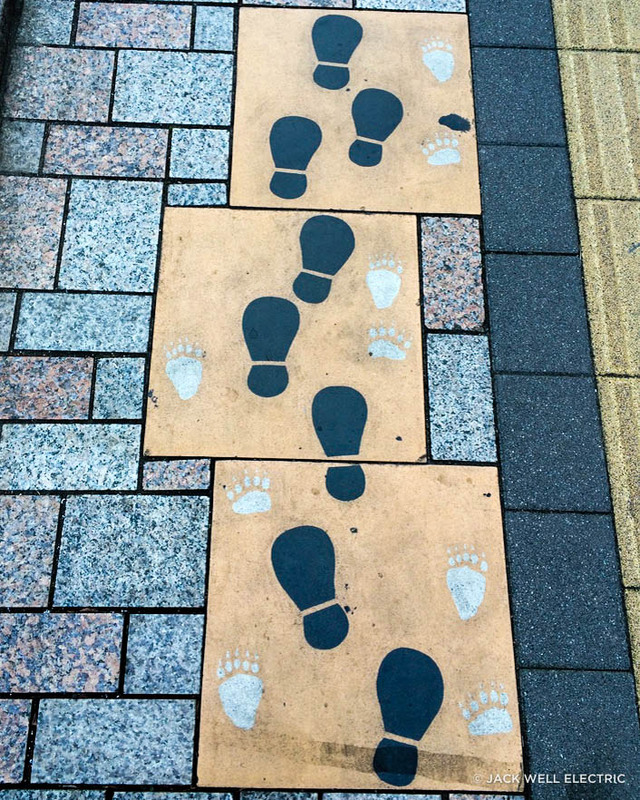 Scattered along the way are beautiful Totoro street signs and footprints pointing you in the right direction. I felt like I was a kid again taking part in a magical treasure hunt. 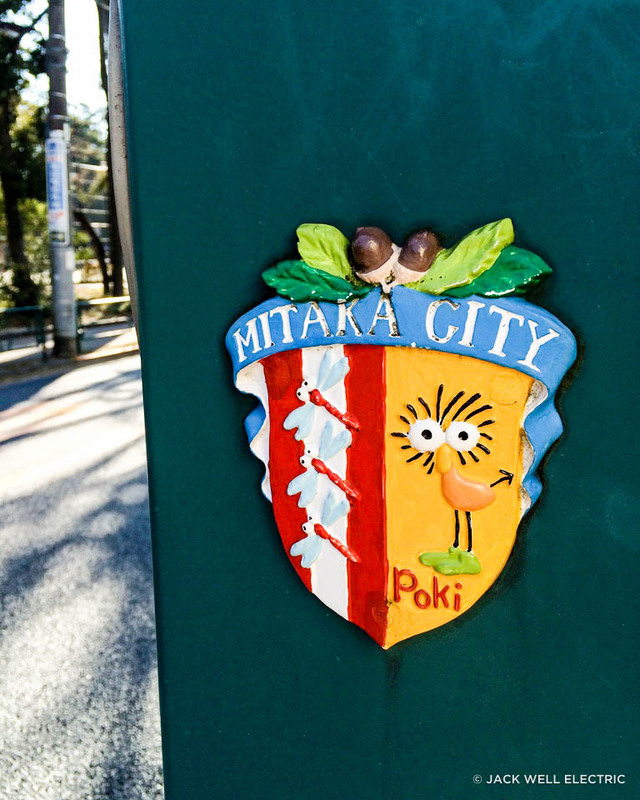 The footprints brought us to a colourful building surrounded by lush green trees and casually chilling in the front window was a giant Totoro. A GIANT TOTORO! 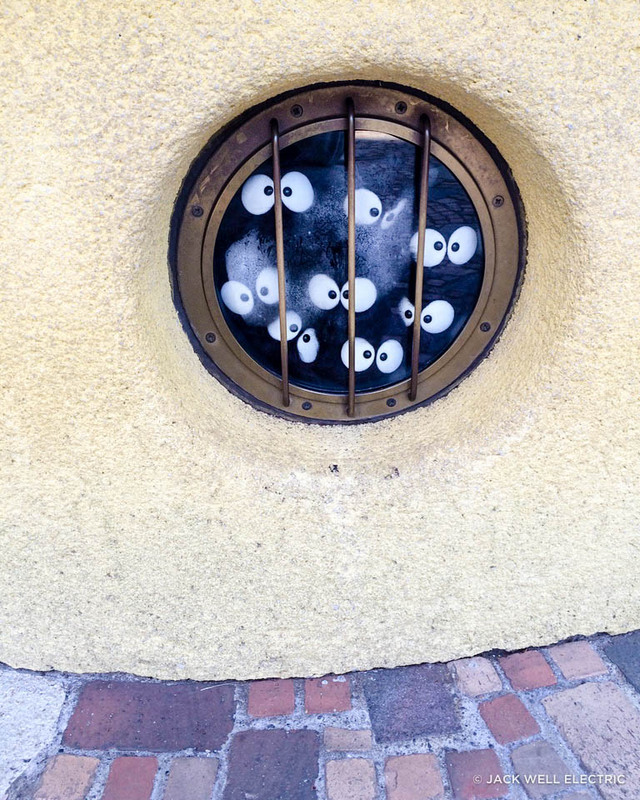 And built into the wall underneath Totoro is a tiny little window crammed full of susuwatari or soot sprites. OMG. Cuteness overload! 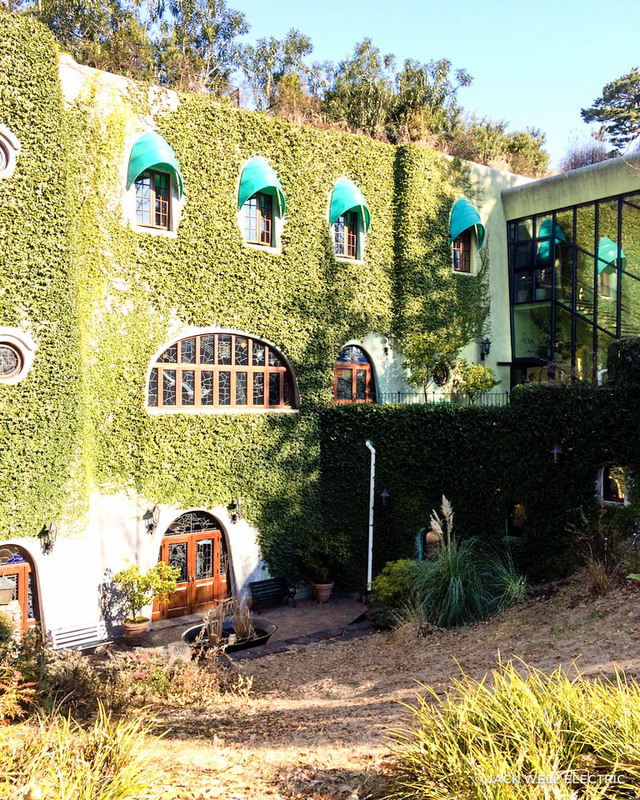 Totoro points the way to the entrance which is through the garden, past the vine covered buildings, down some steps and into a little rabbit warren of a reception. 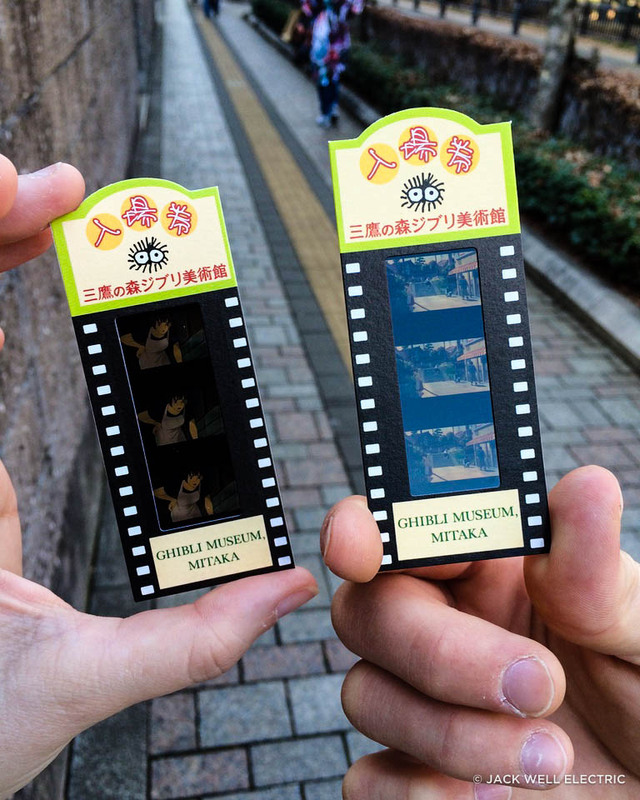 We are greeted warmly and given our tickets which are film strips from various Studio Ghibli movies. STUDIO GHIBLI FILM STRIPS! I’m actually dying at this point with how freaking adorable everything is. 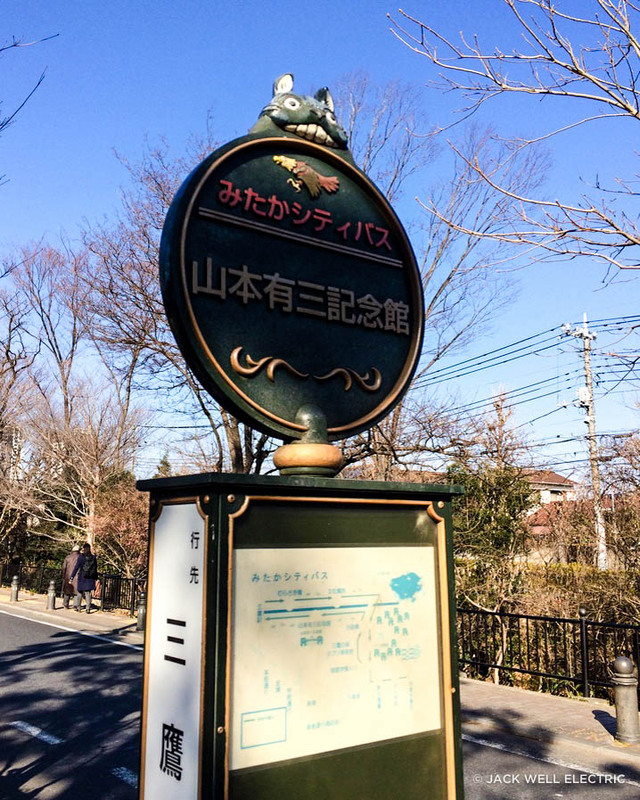 The entrance to Hayao Miyazaki’s magical world. The first area we entered was the central hall and we were seriously blown away. The room opens up underneath a massive glass dome and the architecture is spacious yet cosy with handcrafted accents and zigzagging staircases. 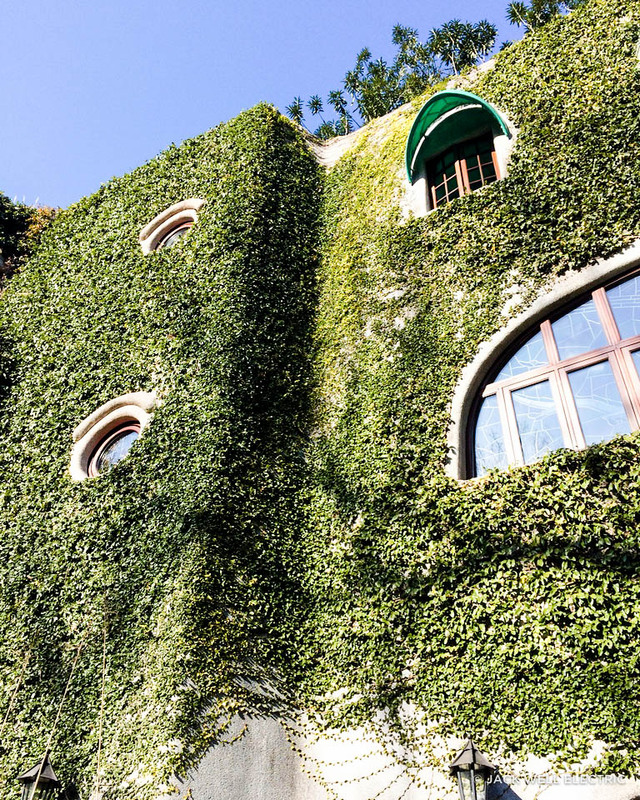 There’s murals, stained glass windows, warm lamps, beautiful flowers, elevators, hidden doors, lookouts and much much more. It was hard to take it all in! Liam and I spent ages exploring all the little secret areas and wandering through the exhibition rooms. One of the rooms even had a cat bus. AN ACTUAL CAT BUS! Unfortunately you had to be 12 or under to play on it. I was gutted. 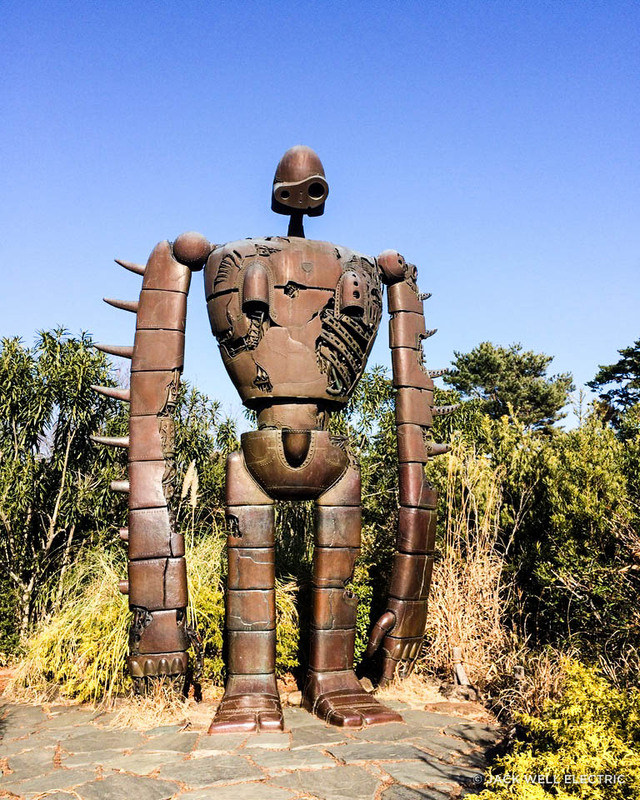 After wandering around inside, through the exhibits, the bookstore and shop we decided to check out the rooftop garden complete with it’s own Robot Solider from Laputa Castle in the Sky. Oh and how do you get to this wonderful rooftop garden you ask? Just up a casual wrought iron spiral staircase covered in vines. No big deal. Whilst outside we went to the Straw Hat Cafe for lunch. We were seated at the bar which was cool because we were able to watch the staff make the drinks and put the finishing touches on the food. We had some sandwiches and pasta which was simple, but oh so delicious. This cafe gets crazy busy, so be prepared to wait a while in line before getting shown to your table. The last area we visited was the Saturn Theater inside the museum. 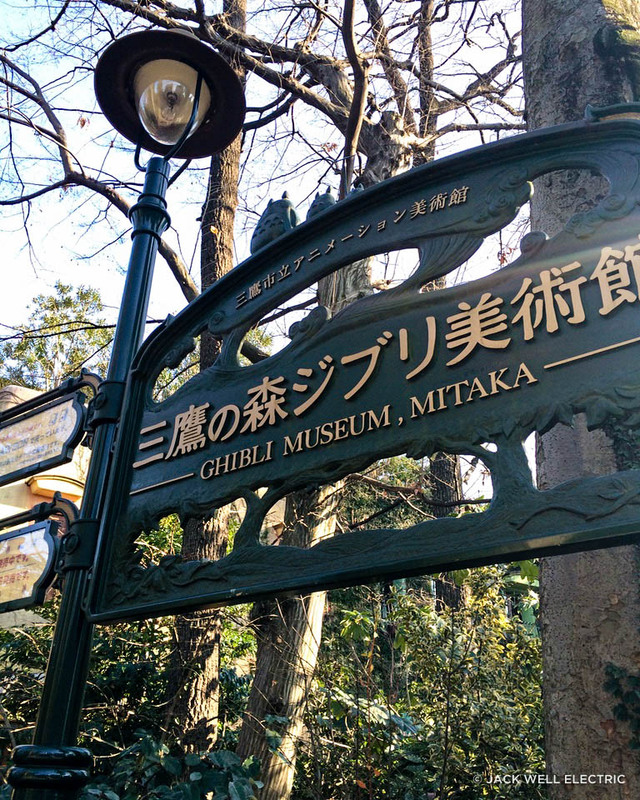 This small theatre is just as beautifully decorated as the rest of the museum and features a short animated film from Studio Ghibli. These films are only shown at the Saturn Theater which makes them even more special. Our entry tickets into the Saturn Theater. 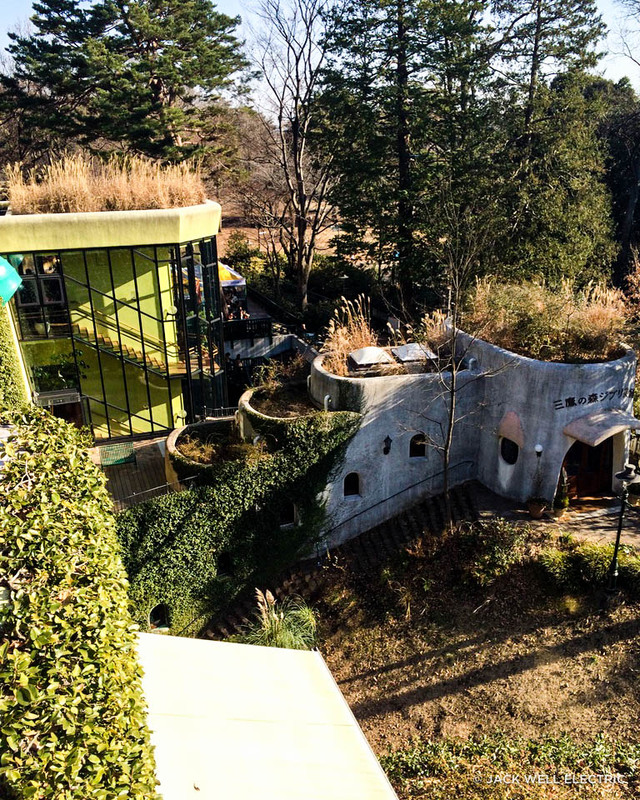 I honestly wish I could live here and chill out on the cat bus with Totoro, Kiki and the rest of the Studio Ghibli gang. From JR Tōkyō take the Chuo Line bound for Ōtsuki and get off at JR Mitaka. 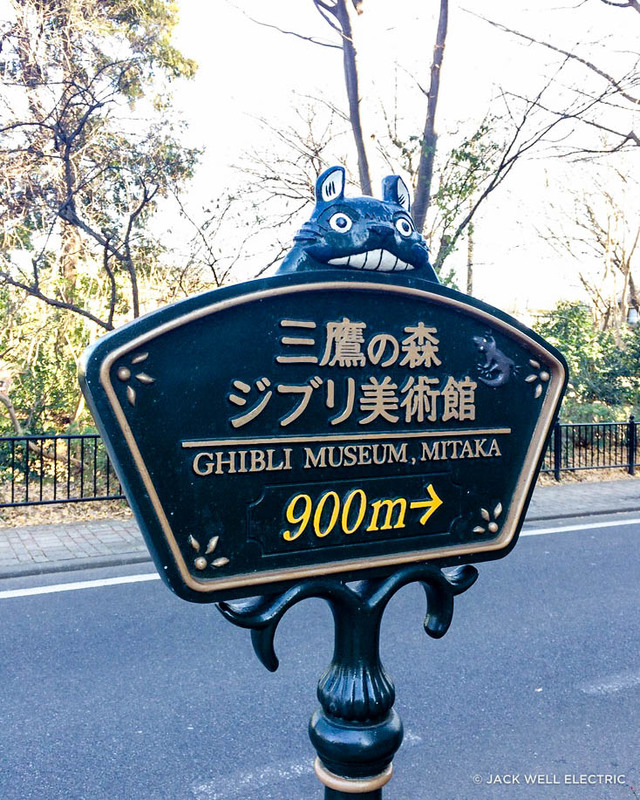 Follow the Totoro signs to Ghibli Museum (about a 10 minute walk).